"Rutte" redirects here. For other uses, see Rutte (disambiguation). Mark Rutte (Dutch pronunciation: [ˈmɑrk ˈrʏtə] ( listen); born 14 February 1967) is a Dutch politician serving as the 50th and current Prime Minister of the Netherlands since 2010 and Leader of the People's Party for Freedom and Democracy (Volkspartij voor Vrijheid en Democratie – VVD) since 2006. 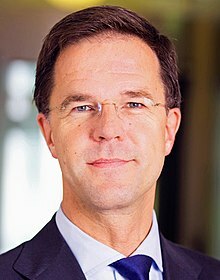 Rutte was previously appointed as State Secretary for Social Affairs and Employment from 22 July 2002 to 17 June 2004 and as State Secretary for Education, Culture and Science from 17 June 2004 until 27 June 2006, when he was elected to succeed Jozias van Aartsen as the new VVD Leader. At the 2006 general election, the People's Party for Freedom and Democracy, already under Rutte, lost six seats, and he became Leader of the Opposition. At the following general election in 2010, the VVD won the highest number of votes cast, resulting in them occupying 31 of the 150 seats in the House of Representatives. After a long formation period, Rutte became Prime Minister and formed the First Rutte cabinet. When Rutte was sworn in on 14 October 2010, he became the first liberal Prime Minister of the Netherlands in 92 years. He offered his government's resignation on 23 April 2012, after an impasse in talks on an austerity budget, prompting a general election in which the VVD won its highest number of seats ever, which led to the formation of the Second Rutte cabinet, a coalition between the VVD and the Labour Party. Rutte was born in The Hague, in the province of South Holland, in a Dutch Reformed family. He is the youngest child of Izaäk Rutte (5 October 1909 – 22 April 1988), a merchant, and Hermina Cornelia Dilling (born 13 November 1923), a secretary. Izaäk Rutte worked for a trading company; first as an importer in the Dutch East Indies, later as a director in the Netherlands. Rutte attended the Maerland Lyceum from 1979 until 1985[circular reference], specialising in the arts. Although Rutte's original ambition was to attend a conservatory and become a concert pianist, he went to study history at Leiden University instead, where he obtained a MA degree in 1992. Rutte combined his studies with a position on the board of the Youth Organisation Freedom and Democracy, the youth organisation of the VVD, of which he was the chair from 1988 to 1991. After his studies, Rutte entered the business world, working as a manager for Unilever (and its food subsidiary Calvé). Until 1997, Rutte was part of the human resource department of Unilever, and played a leading role in several reorganisations. Between 1997 and 2000, Rutte was staff manager for Van den Bergh Nederland, a subsidiary of Unilever's. In 2000, Rutte became a member of the Corporate Human Resources Group, and in 2002, he became human resource manager for IgloMora Groep, another subsidiary of Unilever's. Between 1993 and 1997, Rutte was a member of the national board of the VVD. Rutte also served as a member of the VVD candidate committee for the general election of 2002. Rutte was elected as Member of Parliament in 2003. Rutte served as State secretary in the Social Affairs and Employment ministry from 22 July 2002 to 17 June 2004 in the First and Second Balkenende cabinets. Rutte was responsible for fields including bijstand (municipal welfare) and arbeidsomstandigheden (Occupational safety and health). After the 2003 elections Rutte was briefly also a member of the House of Representatives, from 30 January to 27 May 2003. Rutte later served as State secretary for Higher Education and Science, within the Education, Culture and Science ministry, replacing Annette Nijs, from 17 June 2004 to 27 June 2006, in the Second Balkenende cabinet. In office, Rutte showed particular interest in making the Dutch higher education system more competitive internationally, by trying to make it more market oriented (improving the position of students as consumers in the market for education). Rutte would have been succeeded by former The Hague alderman Bruno Bruins. Before Bruins could be sworn into office, the second Balkenende cabinet fell. In the subsequently formed Third Balkenende cabinet Bruins succeeded Rutte as State secretary. Rutte resigned from his position in government in June 2006 to return to the House of Representatives, and he soon became the parliamentary leader of the VVD. Rutte became an important figure within the VVD leadership. Rutte was campaign manager for the 2006 municipal elections. After the resignation of Jozias van Aartsen, the VVD having lost in the 2006 Dutch municipal election, the party held an internal election for lijsttrekker, in which Rutte competed against Rita Verdonk and Jelleke Veenendaal. On 31 May 2006, it was announced that Mark Rutte would be the next lijsttrekker of the VVD. He was elected by 51.5% of party members. Rutte's candidacy was backed by the VVD leadership, including the party board, and many prominent politicians such as Frank de Grave, former minister of Defence, Ivo Opstelten, the mayor of Rotterdam and Ed Nijpels, the Queen's Commissioner of Friesland. The Youth Organisation Freedom and Democracy, the VVD's youth wing, of which he had been chair, also backed him. During the elections he promised "to make the People's Party for Freedom and Democracy a party for everyone and not just of the elite". His youthful appearance has been likened to the successful former leader of the Labour Party, Wouter Bos. Rutte said that the Christian Democratic Appeal (CDA) party was a group that "the People's Party for Freedom and Democracy could do business with". He had also stated that with the social security ideas of the Labour Party, which he called too socialist, it was unlikely that the VVD would cooperate or form a coalition after the elections. For the 2006 general election, the VVD campaign with Rutte as leader did not get off to a good start; he received criticism from within his own party. Rutte was said to be overshadowed by his own party members Rita Verdonk and Gerrit Zalm, as well as being unable to penetrate between Wouter Bos and Jan Peter Balkenende, who were generally seen as the prime candidates to become the next Prime Minister. On 27 November, it became known that Rita Verdonk managed to obtain more votes than Mark Rutte; he obtained 553,200 votes against Verdonk's 620,555. After repeated criticisms by Verdonk on VVD policy, Rutte expelled her from the party's parliamentary faction on 13 September 2007. In the 2010 general election, Rutte was once again the lijsttrekker for the VVD. It won 31 seats to become the largest party in the House of Representatives for the first time ever. A long period of negotiations followed, with several personalities succeeding each other, being appointed by Queen Beatrix in order to find out what coalition could be formed. Efforts to form a coalition between the VVD, CDA and PvdA failed. Instead the only possibility appeared to be a center-right coalition of liberals and Christian Democrats (CDA), with the outside support of the Party for Freedom (PVV), led by Geert Wilders. After garnering support for such a coalition, Rutte was appointed as formateur on 8 October 2010. Rutte then appointed the ministers, with Maxime Verhagen (CDA) as his deputy prime minister. On 14 October, Beatrix formally invited Rutte to form a government. Later that day, Rutte presented his first cabinet to Parliament, and it was confirmed in office by the smallest possible majority. Rutte is the first Prime Minister since 1918 who is neither a Christian Democrat nor a socialist, as well as the first liberal to hold that post since Pieter Cort van der Linden, who was Prime Minister from 1913 until 1918. He is also the first VVD Prime Minister, and the second-youngest Prime Minister of the Netherlands ever, after Ruud Lubbers. During the Dutch provincial elections, 2011, the VVD confirmed its first party status. In March 2012, seeking to comply with European Union requirements for the nation's deficit, Rutte began talks with coalition parties VVD and CDA and supporting party PVV on a budget for 2013, which would cut 16 billion euros of spending. However, PVV leader Geert Wilders withdrew his party's support on 21 April, stating that the budget would hurt economic growth; which led to the downfall of the government. Rutte submitted his resignation to Queen Beatrix on the afternoon of 23 April. His government lasted for 558 days, making it one of the shortest Dutch cabinets since World War II. In the 2012 general election, Rutte was the VVD's lijsttrekker for the third time. The party won 41 seats and remained the largest party in the House of Representatives. On 5 November 2012, the Second Rutte cabinet was formed, a coalition cabinet with the Labour Party (PvdA). In 2014, The Hague held a Group of Seven special meeting after the Malaysia Airlines Flight 17 was shot down in Ukraine with aboard 193 Dutch nationals. During the municipal elections of 2014, the VVD finished third behind local parties and the CDA; at the European Parliament election the same year, it finished fourth. At the Dutch provincial elections, 2015, the VVD however remained the largest party in the province's legislatures with about 15% of the vote, but lost 23 seats in the States-Provincial. In April 2016, Rutte was appointed by United Nations Secretary-General Ban Ki-moon and President of the World Bank Group Jim Yong Kim to the High-Level Panel on Water. Co-chaired by President of Mauritius Ameenah Gurib and President Enrique Peña Nieto of Mexico, the joint United Nations-World Bank Group panel was set up to accelerate the implementation of Sustainable Development Goal 6 (SDG 6). That month was also held the Dutch Ukraine–European Union Association Agreement referendum, 2016. In November 2016 the House of Representatives approved by 132 votes against 18 a ban on the Islamic burqa in some public spaces including schools and hospitals, a bill supported by the VVD. Rutte's second cabinet completed its four-year term without collapsing or losing a vote of no confidence, becoming the first cabinet to do so since the First Kok cabinet (1994–1998). The VVD approached the general election of 2017 with a ten-seat lead on the PVV in most of the polls. Rutte was found to have well-managed the 2017 Dutch–Turkish diplomatic incident by the public opinion; he presented his third cabinet on 26 October 2017 with Ministers of the VVD, CDA, D66 and CU. The coalition agreement's plan to abolish the 15% dividend tax (providing the state €1.4 billion per year) in 2019 is however highly unpopular as it was not mentioned in any party's program and later appeared that major Dutch companies like Shell and Unilever had secretly been lobbying for that measure. Rutte's government provided materials to the Levant Front rebel group in Syria. In September 2018, the Dutch public prosecution department declared the Levant Front to be a "criminal organisation of terrorist intent", describing it as a "salafist and jihadistic" group that "strives for the setting up of the caliphate". On 21 March 2018 the Dutch Intelligence and Security Services Act referendum was held. It resulted in a rejection. Belgium: Knight Grand Cross of the Order of the Crown (28/11/2016). Rutte is single. He is a member of the Dutch Protestant Church. Rutte still teaches two hours a week at a secondary school, the Johan de Witt College in The Hague. Rutte is known to be a big fan of the writing of Robert Caro, especially his book about Robert Moses, The Power Broker. ^ "Mark Rutte teruggekeerd in Tweede Kamer" (in Dutch). DeNederlandseGrondwet.nl. 28 June 2006. Retrieved 23 April 2012. ^ "Government". government.nl. 14 December 2011. Retrieved 23 April 2012. ^ "Mark Rutte: eerste liberale premier sinds 1918" (in Dutch). eenvandaag.nl. 7 October 2010. Retrieved 23 April 2012. ^ a b (in Dutch) Drs. M. (Mark) Rutte, Parlement & Politiek. Retrieved 2 August 2014. ^ "Rutte had pianoleraar kunnen zijn". De Pers. Archived from the original on 11 March 2012. Retrieved 23 April 2012. ^ a b "CV | Mark Rutte". rijksoverheid.nl. Archived from the original on 20 March 2012. Retrieved 23 April 2012. ^ "Mark Rutte" (in Dutch). VVD. ^ "Biografie – Mark Rutte". elsevier.nl. Archived from the original on 24 May 2012. Retrieved 23 April 2012. ^ "CDA calls for longer working week". dutchnews.nl. 18 August 2006. ^ a b (in Dutch) "Onvrede binnen VVD over Rutte," Algemeen Dagblad (31 October 2006). Retrieved 14 May 2014. ^ (in Dutch) Oranje, Joost and Guus Valk, "Kamp: VVD moet Rutte nu steunen," Archived 15 May 2014 at the Wayback Machine NRC Handelsblad (15 September 2007). Retrieved 14 May 2014. Literal English translation: "Verdonk was yesterday by Mark Rutte formally expelled from the VVD's parliamentary party in the House of Representatives after she had again voiced criticism of the party in the press." Dutch original: "Verdonk werd gisteren formeel door Mark Rutte uit de Tweede Kamerfractie van de VVD gezet, nadat zij in de pers opnieuw kritiek had geuit op de fractie." ^ a b "Election 2010 – The Netherlands shifts to the right". NRC Handelsblad. 10 June 2010. Retrieved 10 June 2010. ^ a b "Dutch government falls in budget crisis". BBC News. 23 April 2012. Retrieved 24 April 2012. ^ Gilbert Kreijger and Thomas Escritt (23 April 2012). "Dutch Prime Minister resigns in budget cuts row". Reuters. Retrieved 24 April 2012. ^ "Volg de verkiezingen 2014 live". De Volkskrant. Archived from the original on 15 September 2012. ^ United Nations Secretary-General, World Bank Group President Appoint High-Level Panel on Water United Nations, press release of 21 April 2016. ^ The Netherlands votes for partial restrictions of the burqa in public space, independent.co.uk, 29 November 2016. ^ "Kabinet-Rutte II verslaat Lubbers III: langstzittende kabinet". NOS (in Dutch). Retrieved 17 October 2017. ^ Rutte: effect afschaffen dividendbelasting op bedridden niet bekend (in Dutch), rtlnieuws.nl. ^ "Dutch govt under fire for Syria opposition support". MSN. 11 September 2018. ^ "Dutch funded 'jihadist' group in Syria, terror trial may now falter". Dutch News. 11 September 2018. Retrieved 16 September 2018. ^ "Ten things you didn't know about prime minister Mark Rutte". Dutch News. 3 November 2015. Retrieved 14 March 2017. ^ "The Dutch Prime Minister Is a Big Fan of Robert Caro". New York Times. 13 May 2016. Retrieved 31 March 2017. Wikimedia Commons has media related to Mark Rutte.